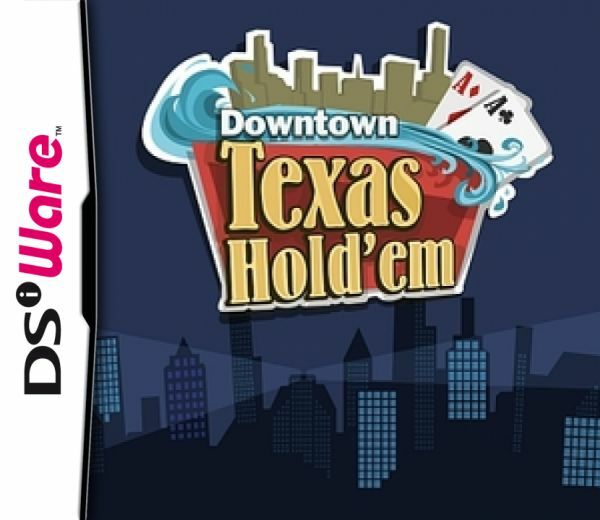 We've already seen a host of card games released on DSiWare so far and Texas Hold'em seems to be the hot new card game to get. Hudson recently released its High Stakes Texas Hold'em onto the service to rather mediocre reviews and now EA is serving up its version of the game with the release of Downtown Texas Hold 'Em. There are basically three modes of play to choose from. The single player game allows you to play through a career mode, of sorts; as you earn money, you'll be able to unlock some of the larger casinos that feature games with higher buy-ins. This will also allow you to play tournaments at these various casinos, sometimes even being challenged to a head-to-head match by one of the local poker stars trying to defend his/her turf. And unlike most other card game simulations we've seen so far, the opponent AI in Downtown Texas Hold 'Em is actually very good and poses a solid challenge, even for seasoned poker players. If you can manage to round up additional players that have their own DSi systems and a copy of the game, you can have everyone join in for some multiplayer. There's not a lot of extra bells and whistles in this mode, but it's a great way to enjoy the game as a multiplayer experience. While an online mode of play would have given the game a lot of added appeal, the exclusion of download play ends up being the biggest stumbling block, as spending 2500 Points just to be able to play the game's 5-player game mode feels excessive. Aside from the two main gameplay modes, you have the option to practise outside of the career mode if you need to touch up your poker-playing skills before taking on the big boys. You can even view all of your available stats to see how you're playing and what areas of your game might need a little work. The controls of the game are well executed and allow you to use either the touchscreen or the actual DS controls if you so choose. Both work well enough, but the touchscreen controls tend to be easier in most cases for selecting various commands, not to mention increasing and decreasing your bets. All in all the game does a very smooth job of making all of the many moves available easy to use and become familiar with. The interface in Downtown Texas Hold 'Em is quite solid and has a nice polished look to it that you don't often see in DSiWare card games. Sure, most of the visuals are nothing more than playing cards and poker chips, but that doesn't stop the game from tossing in some vibrant backdrops from time to time, not to mention some very interesting opponents for players to look at. Much like the simple visual presentation, EA kept the audio package fairly standard with only a short musical introduction track before you tackle a new casino. You'll also still get a nice mixture of realistic playing card and poker chip shuffling sound effects, but it really doesn't go into much more depth beyond that. 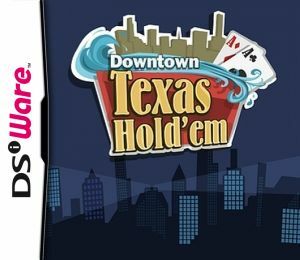 There's certainly no denying that EA has presented a very solid and playable version of the game in Downtown Texas Hold 'Em. The balanced and challenging AI of the game's opponents really lends itself to the game being played as a single-player experience, something not many other versions of the game have been able to accomplish. Of course having said that, it's still a bit disappointing that each additional player is forced to have to purchase and download the game on their own DSi system in order to participate. 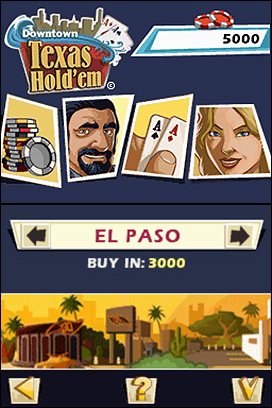 As impressive as the overall gameplay system is, download play could have easily made this a must-have title for Texas Hold 'Em fans, but without it the game can really only be recommended for those looking for a challenging solo experience. That is too bad about the lack of download play. This option would also have given people who haven't bought the game a chance to play it for free to see if they like it. 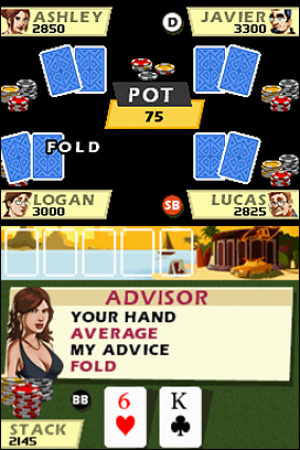 Finally a DSiWare poker game that looks engaging for single-player; I believe you've sold me on it. Same with me. I need something that will occupy me for a long time. Local play won't cut it for me. ALSO: Corbie, your new avatar scares me. It looks decent, but I'll just stick to the Apps at Myspace and Facebook. This version of poker is WAY better than the Husdon version. I enjoy having a goal to go for instead of just playing and stopping with no purpose. For the price it is a really good poker game. Needs more half naked ladies......j/k. If it had WiFi I would given it a go. I expected a more detailed explanation about gameplay. There's hardly in there about AI, except that it will pose challenge to seasoned players. That's putting it mildly. The different play styles with Hudson is stunning. I can play rock with Hudson. EA version forces me to bluff and take risk, early and often, thus pushing the luck factor much higher here. You can't set the ante level, and a bad run of cards will ruin you. Although the game lets you keep certain amount of money after completing each level, it isn't a good feeling having to lose at tournament just because I have a bad run of cards, combined with high ante structure means the ante ate up half my stakes. The AI are merciless. There's absolutely no beginner mode here. The playstyle is cutthroats. Bluffing is a major tactics. The game plays hard and fast. I keep feeling that the game was tuned by arcade twitchers instead of normal board game designers. I was hoping that different casinos location will give a wider range of skill accomodation. It's nice to have an advisor there, telling you how to play your hand. But like all computer advisor, you can do better by thinking. It's also nice that the game does save somewhat, so you can resume interrupted session. I do wish there's an option to make that explicit, though. Just good user experience design. I prefer the button interface to stylus, and it's great that they have it, but sometimes, I pushed the buttons too many times, and select the wrong thing. The way they set it up is fine, there's nothing wrong with it. However, I feel that it can be improved to minimize errors by button mashers like me. The fact that there is a practice mode with selectable levels of difficulty means that I can customize my experience for gameplay. A big plus here. Thank you EA, for putting that in. This one looks ok but I'd need wifi to get any real value. I always find myself trying to play against the code rather than the characters. Im always trying to find tricks to beat the AI and it feels a little empty. I don't have enough friends with DSis let alone ones that would download this so we could meet up occasionaly to play poker on DSi rather than using our real cards and chips... if it had Wifi it might be worth it. Why you can only play short handed in these games is another thing that confuses me but I figure it's because the gameplay would feel too slow and boring against the AI with 8 or 9 players. Pokers not THAT complicated, why cant someone do it right?